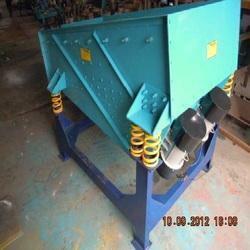 We are a leading Manufacturer of gyro screen and screening machinery from Ahmedabad, India. 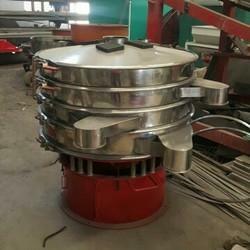 We are engaged in offering Gyro Screen.Circular Vibrating Screen has come out with a most advanced design of screens for grading of fine, wet and difficult to screen materials. The screens work on the principle of gyratory motion. The unique features of this type of sieve are its high capacity using minimum space and less power. The screen has specially designed multi-directional vibration system which prevents blinding of sieves. The material to be screened is fed from the top and collected simultaneously from outlets of different decks. These screens can handle a wide range of materials such as heavy, light, dry, wet, coarse or fine. The company manufactures various sizes to suit individual requirement in MS and SS construction. Vibratory motion is the most effective method for screening. It causes 100% rotary motion and causes dispersion stirring & stratification of material to be sifted. Feed material constantly flows in Horizontal motion along a loop pattern on Vibro screen surface. "EXCEL" Vibro screen provides optimum screening & assures maximum feed-rate & efficiency. These screens are also called the vibrating sieves. The sieves we use regularly at home is in the ground level separation .i.e. small scale while the vibrating screen is the one which is used as a part of the initial processing of the raw materials in many industries. The cement industries, powder industries, companies that make spices, which produce fillers for food products etc. should have the correct mesh size to follow for the particles which are separated by these screens. Screening machinery offered is driven by unbalancing motor with variable eccentric weights on both sides of motor shaft. Looking for Gyro Screen ?